INSIGHT: The Whalers Have Been Shut Down! ABOARD THE STEVE IRWIN IN THE SOUTHERN OCEAN, February 16, 2011 (ENS) – Is it a ploy or the real deal? The Japanese Fisheries Agency is saying that the whale hunt has been suspended due to the interventions by the Sea Shepherd Conservation Society. I think it is premature to see this as a victory for the whales yet. There has been no mention of how long this suspension will be. It could be permanent, for this season only, or it could be for a matter of weeks or even days. 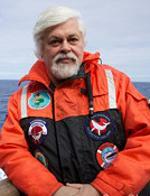 What we do know is that the whalers will not be killing any whales for the next few weeks. Not because of any suspension but because it is physically impossible for them to do so. This is not a voluntary suspension. Sea Shepherd interventions have forced a closure to their illegal poaching activities. The Japanese factory ship the Nisshin Maru is now 2,000 miles east of the whaling area. They are being tailed by Captain Alex Cornelissen and his crew on the Sea Shepherd ship Bob Barker. It appears that they are heading into the Drake Passage, past Cape Horn below Chile and Argentina and into the South Atlantic Ocean. If they do that, they are most likely going to continue eastward around the continent of Antarctica to the Western boundary of their whaling area some 2,500 miles eastward below South Africa. The Yushin Maru #3 is having mechanical difficulties and left the Nisshin Maru two days ago to return to the west. The Yushin Maru #1 and Yushin Maru #2 are most likely still in the Ross Sea. The three harpoons vessels are useless without the factory ship the Nisshin Maru. The continent of Antarctica is like a big round table with the Nisshin Maru and the Bob Barker circling clockwise from west to east. If this is their intention I will send the Steve Irwin and the Gojira westward counter clockwise to meet then as they come around from the west. I am assuming the harpoon vessels will also head westward to meet up with their mother ship. Five ships heading westward and two ships heading eastward and both fleets will most likely meet somewhere below South Africa. Unless of course the entire Japanese whaling fleet decides to head home within the next few days. 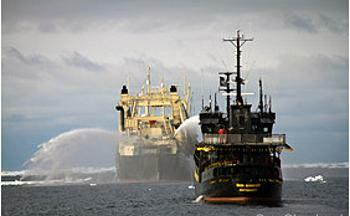 The Sea Shepherd ships will not leave the Southern Ocean until the whalers leave and return to Japan. The Nisshin Maru is presently in the territorial waters of Chile and the Chilean government, the media and the people are watching it closely. It is illegal for whale meat to be transported through Chilean territorial waters. Sea Shepherd has been in touch with the Chilean Navy to keep them updated on the position of the Japanese factory ship. This has been a very successful campaign beginning with our locating the Japanese fleet on December 31st before they had killed a single whale, to tying up two of their three harpoon boats for over a month, and keeping the factory ship and the third harpoon vessel on the run. 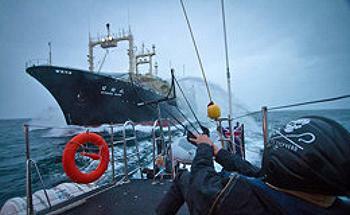 We have had numerous confrontations with the Nisshin Maru and her trio of hunter killer boats. The Yushin Maru #3 appears to have suffered some mechanical damage. The 88 crew from 23 different nations on the three Sea Shepherd ships have succeeded in bringing the Japanese whaling fleet to its knees. We need to keep them there. Every day that we prevent them from killing a whale is a victory. All the efforts of our crews, our shore volunteers and our supporters are paying off. We have demonstrated that a small group of dedicated volunteers can make a significant difference. I am confident that we will restore the integrity of sanctuary to the Southern Ocean Whale Sanctuary and that we will drive these poachers and butchers from the Southern Ocean permanently. Operation No Compromise, our seventh voyage to defend the whales of the Southern Ocean has been enormously successful. Many hundreds of whales will be left alive and free to live when we leave these waters in March.